We also offer ratings and reviews of cookware and kitchen equipment to inform you how different models compare and compete so that you can shop smart. We taste test supermarket ingredients and kitchen staples you use every day, so you know which brands taste best, and which are best avoided. 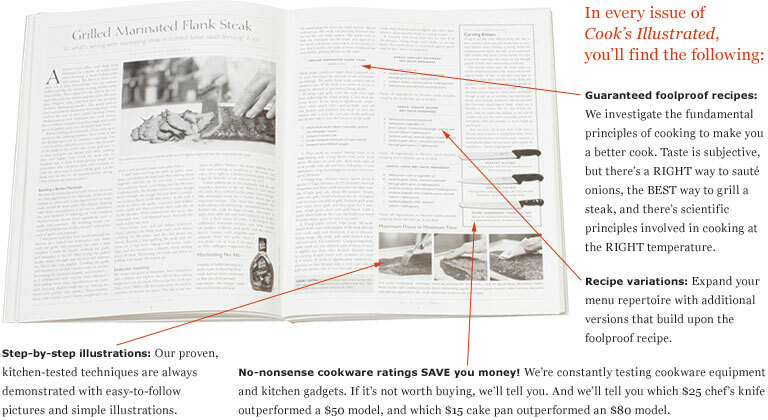 And because Cook's Illustrated is 100% advertising FREE, you get unbiased, objective information. That's my promise to you. Tired of pork roast with a soggy crust and disappointing flavorless meat, we cooked our way through a pigpen's worth of pork to perfect this seemingly easy weeknight meal. To ensure savory, moist flavor in every bite, make sure to score the fat cap on top of the roast before cooking, so the fat can render into the meat. A great "cost cutter" . . .
We performance-test a huge range of kitchen equipment without any preconceived notions equating price to quality—and never fail to get eye-opening results that will save you substantial amounts of money. Our second favorite Chef's Knife costs $210. Our top-rated knife costs $23 . . .
We tested nine Chef's knives by butchering whole chickens, mincing parsley, and every other slicing and dicing job you do in the kitchen every day. Our favorite knife, the Victorinox Fibrox 8-inch Chef's Knife has it all: a comfortable, sure grip and a sharp blade that stayed sharp. It costs $22.95. Of course if you don't like that price, our runner-up handled almost as well, but was nicked for its price: $210. The choice is yours. Why would you pay $80 a pound for mail-order steak when the humble supermarket steak was consistently rated higher in our blind taste tests, and costs just $15 a pound? Our test kitchen staff tested 34 steaks from five mail-order retailers to see how these prime cash cows measured up to the offerings at the supermarket butcher counter. $1,500 in Fed-Ex'd steaks later, we found two major flaws with mail-order steaks: grading and packaging. Most of these steaks are USDA Prime (the highest rating based on fat and marbling in the meat—a good thing). But because the filet is already ultra-tender, the Prime cut tasted no different than most supermarket "Choice" graded steaks. The steaks are also delivered frozen, a big meat mistake — freezing creates ice crystals, which causes meat to become mushy when cooked. Our advice? Buy the supermarket "Choice" steak and put the money you save towards a subscription to Cook's Illustrated magazine. Did you know that your “Italian” extra-virgin olive oil might actually be from Tunisia, and bottled in Maryland? Our blind taste tests of everyday supermarket ingredients give you objective ratings on everything from BBQ sauce and canned tomatoes to tortilla chips, semisweet chocolate chips, and white wine vinegar. And because Cook's Illustrated never accepts any advertising, we're not afraid to name names. Every issue features more than a dozen clever, surprising, yet effective tricks to save time and money in the kitchen—and out on the patio as well. Stop playing a high-stakes guessing game with your steaks. We’ve got a simple way to check the gas level in your tank before you start to grill. 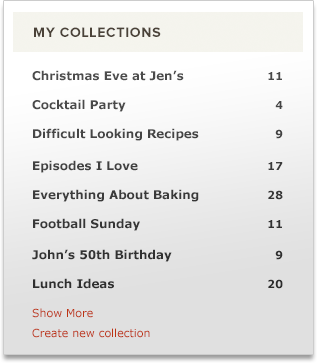 And lots of other great kitchen tips and shortcuts to share. Request your FREE TRIAL ISSUE today! I invite you to request your FREE TRIAL ISSUE of Cook's Illustrated magazine and join the more than 1 million home cooks like yourself who rely on Cook's Illustrated for recipes that work. If you receive your Free Trial Issue, choose to subscribe, and are ever not 100% satisfied with your subscription to Cook's Illustrated, I will refund the balance of your subscription, no questions asked.